The youngest visionary to witness the apparition in Knock in 1879 may be reburied in New York's iconic St Patrick's Cathedral, the Irish Independent can reveal. John Curry was just five years old when he, along with 14 other men, women and children, saw the miraculous vision of Our Lady on a wet August evening over 135 years ago in the small Mayo village. Economic circumstances forced him, as a young man, to emigrate to England and then New York, where he died in 1943, having given his testimony on the Knock miracle to a church investigation in 1937. Speaking exclusively to the Irish Independent on Friday in Knock, Cardinal Timothy Dolan, the Catholic archbishop of New York, said he was thinking of bringing John Curry's remains from where they are buried to the city's cathedral, which holds a special place in Irish Americans' hearts. "We are thinking about moving the grave to St Patrick's - wouldn't that be beautiful?" he said. He said the last time Fr Richard Gibbons, the 45-year-old parish priest of Knock, was in New York, he visited John Curry's grave. "He was a little worried. He said it was obvious that the grave was old and that people had not been visiting it. I said we should move him to St Patrick's," the American prelate commented. Cardinal Dolan was in Knock to officially open the annual novena, which is expected to draw crowds of up to 150,000 over the nine days from until August 22. 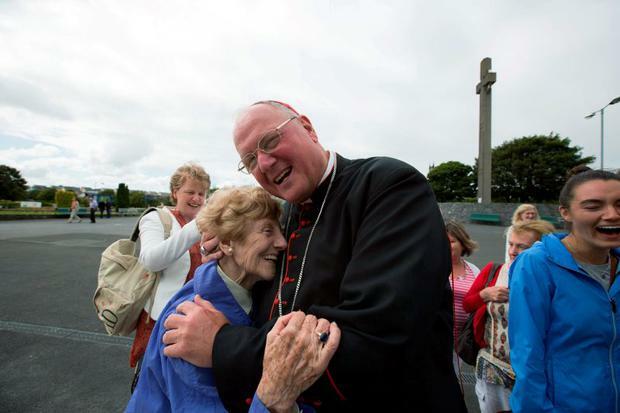 Last Sunday, Cardinal Dolan arrived with 165 American pilgrims for a week-long visit to Ireland which the American underlined was spiritual in its motive. "I told our people from the beginning, 'We're not tourists - this is a pilgrimage.'" They had Mass in Lough Derg, where they spent half a day instead of the traditional three days. "The day was so raw and cold that our people got a good hint of the mortification and the self-denial associated with Lough Derg," explained the cardinal. In contrast, they had a "glorious" day on the Dingle Peninsula on Thursday, when they visited the 6th-century Christian Gallarus Oratory. They also visited Listowel and the Killarney cathedral.